LOS ANGELES — Stanford University has backed down in a months-long row with one of its professors over the use of a photo of President Donald Trump for a flyer promoting a conference on sexual assault. The controversial poster created by Michele Dauber, a law professor at the prestigious California school, includes a screenshot from an infamous leaked video in which Trump crudely boasts about groping women. The screenshot used to publicise the May conference features Trump, TV host Billy Bush and actress Arianne Zucker. "I have been trying for months to get the university to allow the use of this image," Dauber told AFP on Tuesday. "I’m disappointed that it took media reporting in order for the university to honor its obligation to protect faculty academic freedom." Dauber, who has been teaching at Stanford for 16 years, said the university’s attempt to block use of the photo on grounds it could be seen as "partisan" lacked credibility and amounted to censorship. "Difficult content and difficult conversations about controversial issues are what you are supposed to be able to have at universities," she said. "That’s the point of academic freedom and the First Amendment principles that undergird it." Lisa Lapin, the university’s vice president for communications, said the school had initially been concerned "about the appearance of partisanship" especially as the flyer was going out under the name of the law school, not the professor. "It was determined that the image to be used on publicity materials was not a violation of policy," Lapin said. "At US universities, institutions cannot take partisan positions, though individuals are free to express their views," she said, adding that all the publicity material for the May 1-2 conference had now been printed and was being distributed. The event will focus on campus sexual assault and Title IX, the federal law that protects victims of sexual violence and which could be revised by the Trump administration. Dauber said the incident over the poster went to the heart of free speech and the integrity of Stanford and universities across the country. "I think what we’re dealing with is the chilling of free speech under Donald Trump, especially in the context of sexual assault," she said. "I think that Stanford is definitely an institution that has struggled and made a lot of missteps in the area of sexual assault and this is one more example showing that Stanford still has a lot of work to do." The university came under intense scrutiny last year after one of its students, Brock Turner, was found guilty of sexually assaulting an unconscious woman outside a fraternity house on campus. Dauber has been leading a movement to have the judge who sentenced Turner to six months in a county jail recalled. 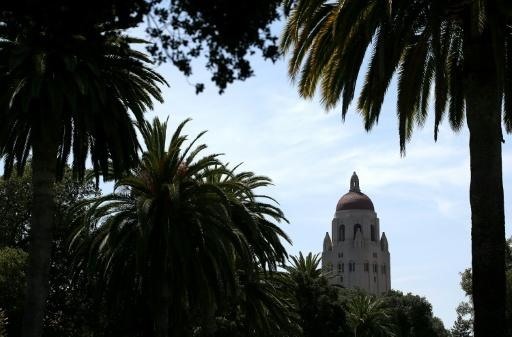 Stanford also came under criticism after it banned hard liquor at on-campus parties in the wake of the Turner case, a measure denounced by some as short-sighted and failing to address concerns about sexual assault.